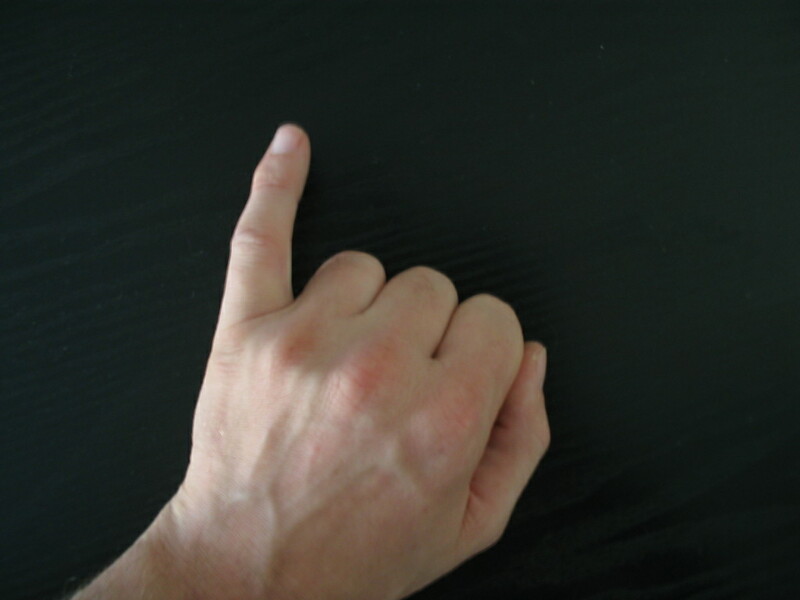 Hand shape & personality: extraverts have wider palms, introverts have longer fingers! Measurements on the hands of male and female extroverts indicate that wide palms + short fingers (typical for a ‘Fire hand shape’) is a typical combination seen in the hands of Extraverts (= high scorers on the Big Five personality dimension Extraversion). And long fingers + narrow palms (typical for a ‘Water hand shape’) are much more often seen in the hands of Introverts (= low scorers). PS. Beyond the confirmation of the classic hand-shape theory (including elements from Kretschmer & Sheldon’s somatotypes), one could also say that these results have a NATURAL PRINCIPLE incorporated; for, when people grow older the personality tends to develop more towards introversion and the hands get narrower and more slender! Hand signs for Extraversion / Introversion! 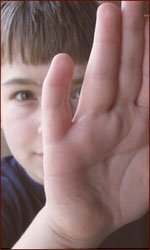 A new study (2012) shows that the hands of ‘extroverts’ tend to vary signficantly from the hands of ‘introverts’. 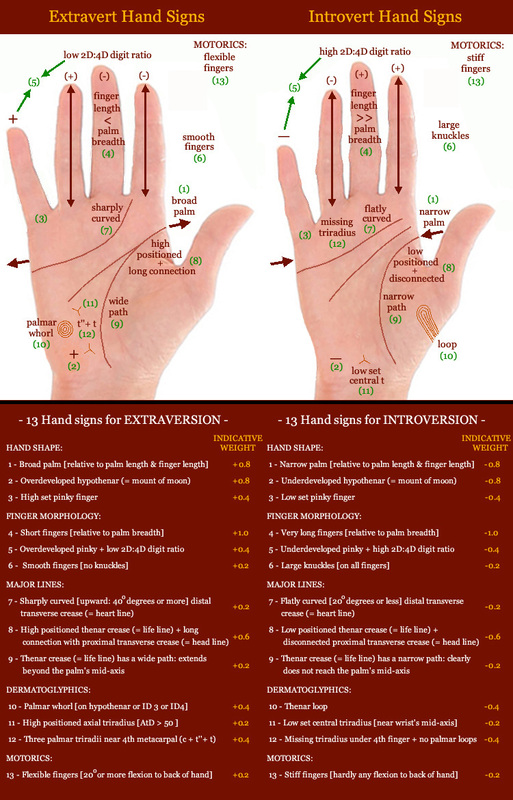 Those scoring high for Extraversion appear to have short fingers, a wider palm shape, and the ulnar (pinky) side of the hand appears to be more well developed. While introverts tend to have longer fingers, a narrower palm shape, and the radial (thumb) side of the hand tends to be more well developed. The study also points out that it is quite impossible to recognize personality traits from just one hand characteristics: combining characteristics (in multiple hand dimensions) is essentail! Find your Masculinity/Femininity factor in just 3 steps via your hands! Discover your MASCULINITY/FEMININITY hand factor by combining your digit ratio with your hand shape ratios! By combining Professor John Manning’s ‘2D:4D digit ratio’ with three hand shape ratios it is fairly simple to find the Masculinity/Femininity factor in your hands. How to assess your masculinity/femininity? Find your hand shape in 3 steps! 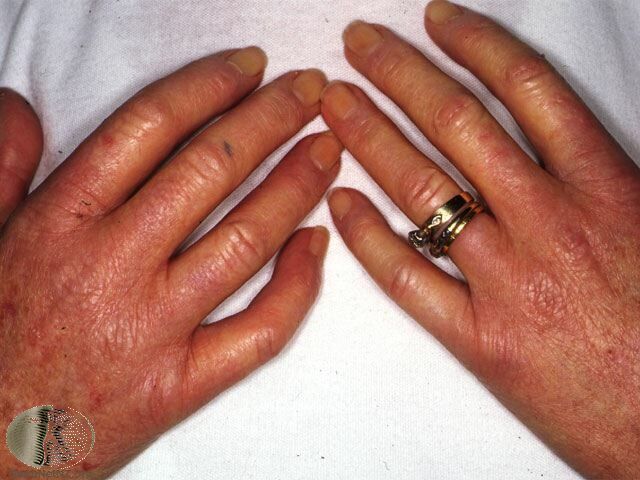 A Hand-Test for recognizing Marfan syndrome! 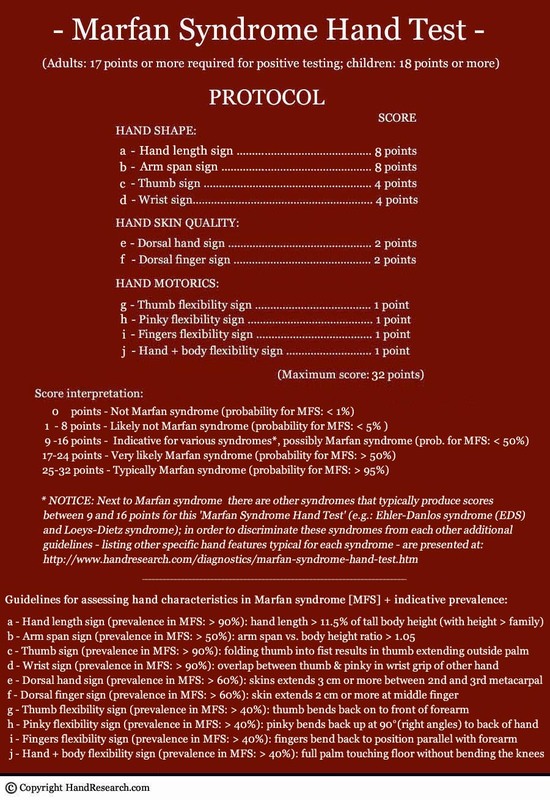 In may 2011 a detailed report was presented at this blog about how a ‘multi-perspective’ approach to the hand can be used to find the most essential hand characteristics in Marfan syndrome. Dozens of comments, questions and suggestions were made in response. 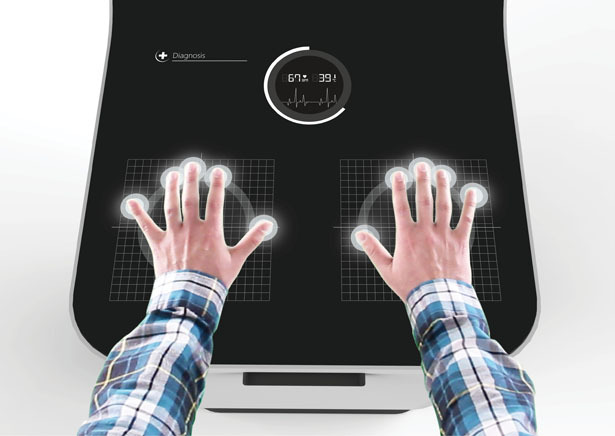 The brand new ‘Marfan Syndrome Hand Test’ (see above) provides you a unique opportunity to make a first check-up for Marfan syndrome via your own hands! 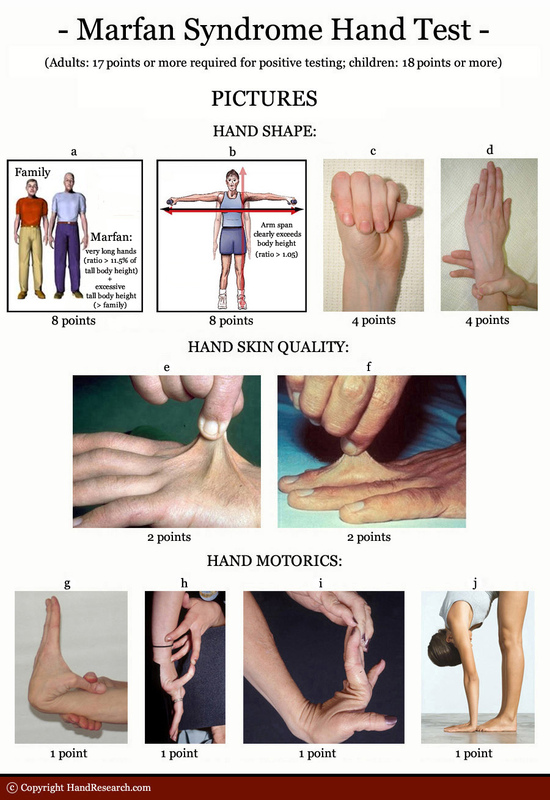 The most discriminating hand featured typical for Marfan syndrome are included in this test – including: various aspects of arachnodactyly (spider fingers), which manifest via the hand shape; various guidelines for recognizing skin hyperelasticity, which relates to the hand skin quality; and a short list of hand signs for hypermobility, which relates to the hand motorics.